Peas are almost entirely self pollinating, and only very occasionally cross with other plants. 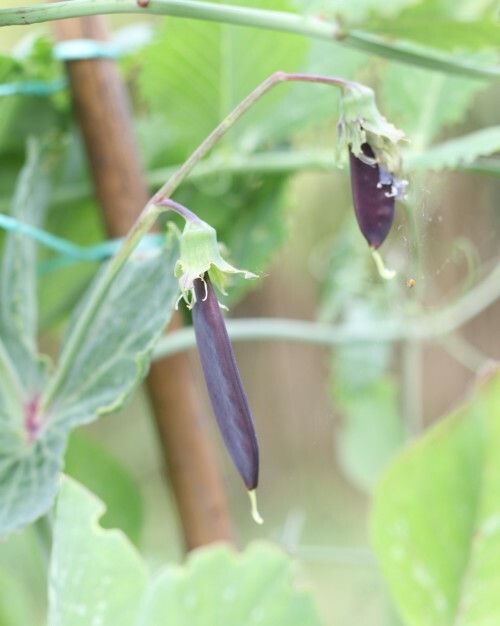 As peas are inbreeders (that is, they self-pollinate), you can save seed from just a few plants — it is better, though, if you grow as many plants as possible (HSL recommend around ten plants per variety). 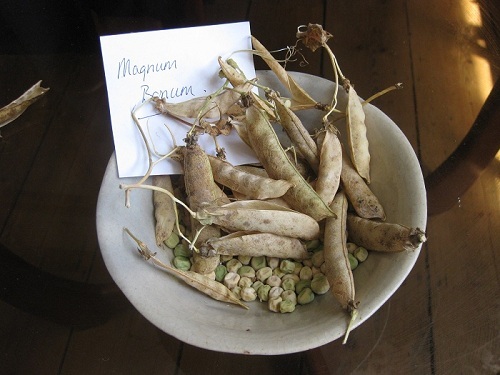 To avoid mixing up of the seeds, separate different varieties of pea with another crop. You should check the plants from time to time as the peas grow, and take out any plants that are weak or not true to type. 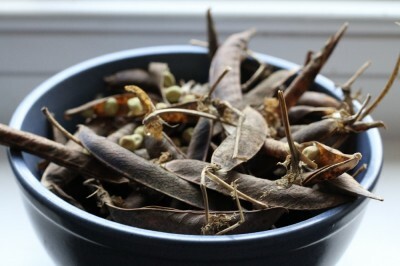 Some plants may produce noticeably different foliage or pods from the majority of the plants; you should not save seed from these atypical ones, and the plants should be removed. 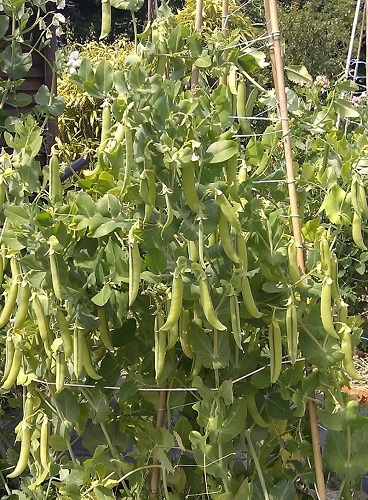 Let the peas mature until the pods are brown and the seeds start to rattle. If the weather is bad or there is a risk of frost, pull up the whole plants and bring inside (for example hung upside down from the shed roof) to ripen and dry further. Once the pods are really dry, shell the peas out. The shelled peas need to be dried a bit more to make sure they wont rot when you store them so dry them a bit more in a warm (but not hot) place, label and date them and store in jars or envelopes. Remove any peas that are damaged or discoloured. HSL advice on the Pea Moth – “You may notice small holes in some of the seed with a powdery deposit round them. This is a sign of pea moth, which lay their eggs on pea flowers. The caterpillars then eat their way out of the pods, often eating a few of the pea seeds in the process. If you notice signs of pea moth in harvested peas, you should pod them immediately or they will continue being eaten.” One way to ensure Pea Moths don’t continue munching on your dried (saved) peas is to freeze them for approx 2 days, this will make sure the pea moths are killed. A wellie wearing urbanite IT/social media project manager exploring life through gardening commissions, garden and food writing, and as a published photographer I’m always on the lookout for the next image. Living on the south coast of England, I spend as much time gardening as possible and if not actually gardening at least thinking about it. And from the allotment and garden comes the food I cook, eat and share. Essentially it's all about growing, eating, sharing and living a LOT. The alternative title to this post is "where did you get to Claire" - it's the most common response I've had when I've visited my blogging buddies blogs recently. So it's about time I answered the question. I'm a fan of alliteration. It's impossibly appealing. Rolling the letters around your tongue, playing with words and seeing where they take you. I came up with the title after a visit from a blogging buddy (you see I can't escape the alliteration appeal - oops there's goes another!). The allotment sorely needs my attention right now, it will be planting time soon and a) I haven't done any preparation and b) probably even more pressing is that I haven't sown any seeds.